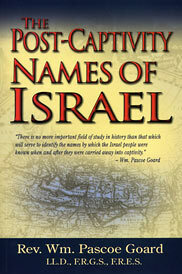 According to the author "There is no more important field of study in history than that which will serve to identify the names by which the Israel people were known when and after they were carried away into captivity." Goard identifies these names while presenting conclusive evidence to show that these people once known as Israel were not as some claim merged among the other nations nor were they as others claim merged with the House of Judah and thereafter all known as Jews. The reader is brought face to face with the facts of history recorded on clay tablets and stone monuments docketed catalogued and numbered in the British Museum. For good measure he has added eight informative and educational Appendices furnished with quotations from accredited authorities for which chapter and page are given. This book goes a long way in proving to the open-minded searcher while at the same time reassuring the already convinced who the people are today whose roots can be traced back to ancient Israel . . . and they are not the people most generally identified as such. THE ORIGINS & EMPIRE OF ANCIENT ISRAEL.